Retired but still photogrpahing the world! I am getting 15 blinks on my canon pro-10 and all cartridges are lit. It won't reset. Got any advice? Thanks. I see others recommending you as a potential source for 3880 OEM Ink chips to use with refillable carts such as those at Inkjetmall? Do you have such a set you might be willing to sell? If not, do you know anyone who might have such a set? harold davies Am I confused or do you not create PRO 10 .icc's using Precision Colors Signature Ink 2? I am about out of OEM and have refilled my spare set according to your directions. Don't I need different icc's when changing inks? Could you send me the file for the Primera Bravo II barcodes? Hey Jose I enjoy your videos can't find your email anywhere but I have an Epson P600 I'd like to convert it to strictly to B&W printer I'm thinking of Piezography and don't know to much on the subject what your thoughts on doing the conversion. 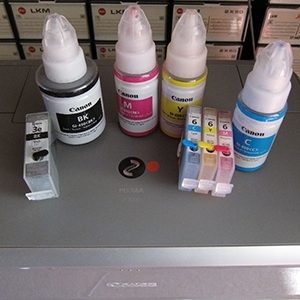 I do refill my OEM Epson carts applying the method which you developed. I am now trying to locate and purchase a complete set of original OEM chips for the cartridges in my Epson Pro 3880. "The Hat" suggested that you might be able to help me? Hey Jose'. You posted some very informative videos about the Canon Pro9500 MkII. I have a 9500 MkII with a "no power up" (no lights/sound when pressing power button)Canon K30309 power adapter tested and showed no more than 7.89dcv across the 9pins. sounds like replacing the print-head or logic board. But I don't want to just throw parts at it. Do you have any suggestions for the next steps? I own an Epson Stylus Photo R2000 and got my first “Parts inside your printer are near the end of their service life" message today. How do I purchase your Reset Tool program CD? Incidentally, how many more images can I print before my printer stops working? Should I stop using it until I get your CD and reset the counter? Any information is much appreciated. Hi Joe, I just posted about a deep magenta color cast on my 7800. I wonder if you have time to look at the pictures. Have you seen this in an Epson printer before?